(4 Lines 5 Handsets, including Music onhold Connection ) - You Can also connect a Voip Phone Line to this Small Office in a Box Telephone system. HURRY!!! for limited time only. 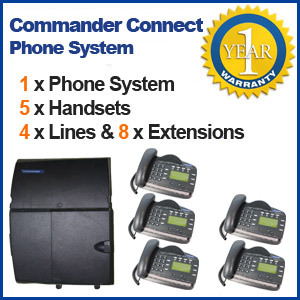 This System is " Very Easy installation - Plug and Play"
This system can easily accommodate cordless phones, fax machines & Eftpos The Commander is easy to use and grow with one touch button that can be programmed for the features you'll need all the time. Accessing multiple features is a breeze with "Help" prompts that magically guides you through during each stage of your call. With a proven record of reliability and extensive experience, Aristel now brings you the cost effective digital Telephone Systems that have the same powerful features of the Commander Easy to install and use with advanced digital functionality. Commanderis perfect for any small to medium business.